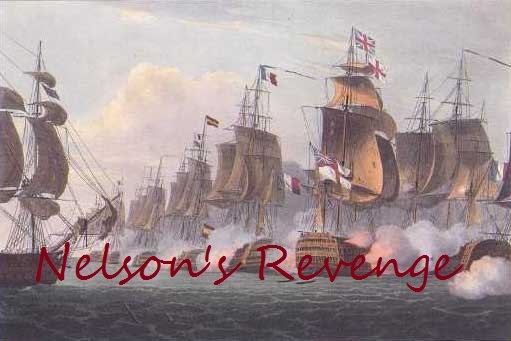 Nelson's Revenge: I knew it!!!!! I knew this would come back to haunt me, once one swears loyalty to the Ruinous Powers there's no going back. A long time ago when I was young and foolish I swore an oath to Father Nurgle, Lord of Flies and Decay and purchased several units for a mixed mortals, deamons and beasts army. The Eternal Enemy from Nottingham (nope, NOT the Sheriff you clowns) however used His foul magicks and separated the 3 armies, never to be joined again and so I walked away in disgust and dissapointment vowing never to return and playing to their terms. For years I was happy and feeling free, I even started a family and carved out a living for myself and my loved ones knowing that time itself would eventually break The False Ones hold over the gamingcommunity since they've always insisted on flooding the world with overly expencive miniatures. But all that wasn't meant to last, when I checked our forum today I saw a sign that drove all the air from my lungs. The Dawi Zarr, or Chaos Dwarfs, are returning and with them they try to drag as much souls as they possibly can into the maelstrom called Warhammer. I cannot stand idle, my warrior's soul wich I tought dormant for all these years is stirring and in the back of my mind I can hear the Plague Lord's siren song. What you kids can see here is the beginning of my Nurgle Force and those with large eyes and even larger brains will notice that very few models are GW's, I do have some pride left you know. The Greater Deamon is an old Confrontation model, The Herald is a Classic Games Workshop Chaos Champion with fly-head, The Plaguebearers are from Heresy Miniatures and the commandgroup is in the mail, The Nurglings are a mix of GW and Heresy miniatures and the Beast of Nurgle is a scratchbuild of a real sea shell and whatever crosses my path in the Dungheap. Hashut cometh... HASHUT rises... ALL PRAISE HASHUT!! !